Is Your Mac Ready to Take Full-advantage of Snow Leopard? "...Snow Leopard runs on a 64-bit kernel, and to take full-advantage of this new OS, you need a Intel-based Mac running a 64-bit processor. So how can you tell if your Intel-based Mac has a 32-bit or 64-bit processor? Follow the instructions below to find out...."
Also see Pre-order Mac OS X 10.6 'Snow Leopard' for $29. Link: Is Your Mac Ready to Take Full-advantage of Snow Leopard? "Virtualization is one of the most useful features of current computing hardware, allowing you to run multiple operating systems at once on a computer at near-native speeds. Despite its benefits, one of the big problems is that while many people have Windows software, they do not want to pay extra for running it on their Macs." "Microsoft's recently released Service Pack 2 for Office 2008 for Mac makes it impossible for many users to open Office files created on PCs. "The 'update' - Microsoft Office 2008 for Mac Service Pack 2 (12.2.0) - was released last Monday...."
The Irish Times' Ravi Mattu riffs on how a sense of community matters, from the playground to the workplace, and how Apple's corporate success has been not only due to Steve Jobs' vision, Jonathan Ive's brilliant industrial design sense, and smart corporate management, but in large part attributable to the fact that many of its most devoted customers think of themselves as more than mere consumers but rather "citizens of a kind of Apple nation, whose loyalty to the brand is about more than owning the best gadgets; it is about being part of a tribe and spreading the word...."
PR: Apple has expanded the maximum Time Capsule capacity to 2 TB, and will continue the existing 1 TB model as well. Consistent with Apple's recent price-cutting trend, the new 2 TB model sells for the price of the previous 1 TB model while the 1 TB Time Capsule drops to $299, and a the 500 GB model has been discontinued. With Time Capsule, the nagging need to back up has been replaced by automatic, constant protection wirelessly. Time Capsule includes a wireless 1 TB or 2 TB hard drive designed to work with Time Machine in Mac OS X Leopard. Just set Time Capsule as the designated backup drive for Time Machine, and that's it. Depending on how much data you have, your initial backup with Time Capsule could take overnight or longer. After it completes, only changed files are backed up - automatically, wirelessly, and in the background. So you never have to worry about backing up again. If you multiple Mac computers, Time Capsule can back up and store files for each Leopard-based Mac on your wireless network. For current deals on new and discontinued Time Capsules, see Low End Mac's Best Time Capsule and AirPort Prices. PR: Amazon has made Apple's forthcoming major upgrade of the OS X operating system available for pre-order at $29. Projected to ship in September, Snow Leopard is a truly exciting and even revolutionary development of Mac OS X, featuring half the footprint of previous versions, great new features in Expose & Stacks, quicker Time Machine backup, and faster wireless network interaction. Free shipping on orders over $25 and Amazon.com's Pre-order Price Guarantee. If the Amazon.com price decreases between time of pre-order time and the end of the day of the release date, you'll get the lower price. PR: Picasa and Picasa Web Albums allows you to organize, edit, and upload your photos to the web from your computer in quick, simple steps. Arrange your photos into folders and albums and erase their blemishes using powerful editing tools in Picasa. Then use Picasa Web Albums to share those perfected photos online with family, friends, and the world. Fixed an issue where applying the 'Retouch' edit created a 0 KB new file. Fixed an issue where Picasa for Mac caused very high CPU usage for some users. PR: When you connect a PC-style keyboard to a Mac, the Windows key acts as the Command key and the Alt key acts like the Option key. In other words, the keys' positions are reversed compared to an Apple keyboard. You can swap them in System Preferences, but the swap affects all keyboards, so if you sometimes use the keyboard built into your MacBook and sometimes an external keyboards, you have to turn the swapping on or off each time you switch from one keyboard to the other (e.g., when you arrive at work in the morning). AppleScript UI scripting can make this chore somewhat less painful, but it is still cumbersome and slow. Consistent Keyboards is a little daemon that runs in the background and swaps the Option and Command keys - but only on PC-style keyboards. Thus you don't have to do anything when you switch between keyboards. Known bug: Consistent Keyboards is not able to swap Command and Option while the focus is on a secure text field (e.g., the password prompts in most applications). This is a Mac OS X security feature. System Requirements: Consistent Keyboards runs on Intel- and PowerPC-based Mac computers. It works with Mac OS X 10.4 ("Tiger") and Mac OS X 10.5 ("Leopard"), but 10.5 already has similar functionality in System Preferences. PR: IDFusion Software announces the first public release of Bodega, a free corner store for Mac apps. Mac users have never had an easy time finding new applications. Bodega, free for both users and developers, changes all of that. A one-stop shop for software needs, Bodega makes it simple for people to discover great, new software, while also giving developers a new way to sell their wares. Bodega's creators have been working closely with developers in advance of the first public release, available now. With an already impressive lineup of software companies on board, Bodega features an extensive catalog of applications - a catalog that continues to grow daily - and includes paid, free and open-source apps. "We've had a phenomenal response from both users and the development community," said Phil Letourneau, User Interface Designer for Bodega. "Everyone is very excited about having a single, dedicated place to discover new applications." In addition to a simple, easy-to-use search interface, users can also browse the top- rated and most-downloaded applications, giving them an easy way to see what's hot in the Mac community. And Bodega's ratings and comments make it easy to find software others are raving about, while skipping those not worth the download. The storefront also gives users links to press clippings and blog postings, so they can see what tech writers have to say about an app. 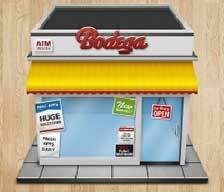 Bodega lets customers buy directly from developers, giving them the lowest price while making sure their money ends up in the pockets of the people who built it. Users will never again have to waste time hunting for old license keys or receipts. When purchasing an app through Bodega, users can save their receipts in the application, making reinstallation a hassle-free process. Bodega also takes the headache out of updating by checking for application updates to make sure a user's software is up-to-date. When Bodega finds outdated apps, downloading an update takes a single click. Future versions will include a batch update feature, allowing a user to stay current with a single click. PR: DEVONtechnologies, LLC releases the sixth public beta of version 2.0 of all editions of its information manager DEVONthink as well as of the smart note-keeper DEVONnote. The sixth public beta of DEVONthink 2.0 and DEVONnote 2.0 adds a first bunch of PDF annotation functions (more to follow soon) to DEVONthink, a further enhanced interactive web interface (DEVONthink Pro Office only) and many further enhancements. Text in editable PDF documents as well as in web archives can be highlighted, underlined, and struck through, the next beta will also add the still missing standard PDF annotations known from Preview, graphical marks and sticky notes. New notes can be created via a customizable hot key that opens the new 'Take Note' panel or via the completely rewritten Dashboard widget. In DEVONthink Pro and up items can be moved from one database to the other instead of being copied and databases can be easily archived for secure backups with a single menu command. Cover Flow and Quick Look support has been enhanced for higher usability and a better user experience. DEVONthink Pro Office's web interface now allows to upload files from any workplace directly to the database, uses a resizable side bar and shows additional information about the selected item. In addition it allows to choose search options and the iPhone web application supports 'See Also'. All editions also come with more than hundred further internal changes, performance and stability enhancements, and bug fixes. "The continuing work on DEVONthink Pro Office's web interface and the addition of the first PDF annotation functions proves our commitment to make DEVONthink the number one productivity and document management tool for the Mac", says Eric Bohnisch-Volkmann, President of DEVONtechnologies. The version 2.0 upgrade addresses a large number of feature requests from the active user community and modernizes almost every aspect of the applications. These public betas are still incomplete but the already existing functionality is stable enough for sharing with the public. Smart tags, PDF annotations, enhanced image editing as well as the ability to upload files through the web interface are not implemented yet but will be delivered one after the other with each subsequent update. The user interface of all editions will be further polished, too. New features of version 2.0 include but are not limited to: the ability to open multiple databases simultaneously (DEVONthink Pro), all advanced Boolean and proximity operators (as known from DEVONagent), wildcards and unlimited complex search terms, smart groups, unlimited undo/redo, an inbox, a trash can, and the support for almost all common file formats. The new Finder-like sidebar facilitates working with multiple databases. DEVONthink 2.0 allows to create documents from templates and DEVONthink Pro Office 2.0 shares databases with other users on the local network or over the Internet via an interactive web interface based on the latest web technologies. RSS, RDF and Atom news feeds can be added as self-updating groups to any DEVONthink Pro database and so integrate live content with local documents. The independent 'Sorter' panel lets the user add data to your databases even when DEVONthink Pro is not open. Tabbed browsing and editing as well as Cover Flow simplifies working with large numbers of documents. A PDF sidebar allows rearranging and deleting pages. The public beta releases of DEVONthink Pro and Pro Office 2.0, DEVONthink Personal 2.0, and DEVONnote 2.0 require Mac OS X 10.5 or later and can be downloaded from www.devon-technologies.com. DEVONthink and DEVONnote can be test-driven for free for 150 hours of noncontinuous runtime until they need to be properly licensed. The public beta releases run without registration until December 31, 2009, before they need to be replaced by new betas or the final 2.0 releases. DEVONthink Professional Office sells for $149.95, DEVONthink Professional for $79.95, DEVONthink Personal for $49.95, and DEVONnote for $24.95 in DEVONtechnologies' online shop. DEVONthink Pro Office and DEVONthink Pro are also available with the Internet research agent DEVONagent as bundles.